Definition at line 47 of file llmanip.h. Definition at line 50 of file llmanip.h. Definition at line 106 of file llmanip.h. Definition at line 94 of file llmanip.cpp. Implemented in LLManipRotate, LLManipScale, and LLManipTranslate. Definition at line 136 of file llmanip.h. Referenced by LLToolCompRotate::handleDoubleClick(), LLToolCompScale::handleDoubleClick(), LLToolCompTranslate::handleDoubleClick(), LLToolCompRotate::pickCallback(), LLToolCompScale::pickCallback(), and LLToolCompTranslate::pickCallback(). Definition at line 144 of file llmanip.cpp. References FALSE, LLSelectMgr::getGrid(), gSelectMgr, LL_X_ARROW, LL_Y_ARROW, LL_Z_ARROW, LLVector3::rotVec(), TRUE, LLVector3::x_axis, LLVector3::y_axis, and LLVector3::z_axis. Referenced by getManipNormal(), LLManipTranslate::handleHover(), LLManipTranslate::handleMouseDownOnPart(), LLManipTranslate::renderSnapGuides(), and LLManipTranslate::renderTranslationHandles(). Definition at line 102 of file llmanip.cpp. References LLVector3::clearVec(), gCamera, LLCoordFrame::getAtAxis(), LLSelectMgr::getGrid(), getManipAxis(), gSelectMgr, LL_X_ARROW, LL_XY_PLANE, LL_XZ_PLANE, LL_YZ_PLANE, LL_Z_ARROW, LLVector3::normVec(), LLVector3::rotVec(), LLVector3::x_axis, LLVector3::y_axis, and LLVector3::z_axis. Definition at line 248 of file llmanip.cpp. References gAgent, getMousePointOnPlaneGlobal(), LLAgent::getPosAgentFromGlobal(), and LLAgent::getPosGlobalFromAgent(). Referenced by LLManipRotate::dragConstrained(), LLManipScale::dragCorner(), LLManipScale::dragFace(), LLManipRotate::dragUnconstrained(), LLManipRotate::findNearestPointOnRing(), LLManipRotate::handleMouseDownOnPart(), and LLManipRotate::highlightManipulators(). Definition at line 257 of file llmanip.cpp. References f, FALSE, gAgent, gCamera, LLCamera::getAspect(), LLAgent::getAvatarObject(), LLAgent::getPosAgentFromGlobal(), LLAgent::getPosGlobalFromAgent(), LLViewerWindow::getWindowHeight(), LLViewerWindow::getWindowWidth(), gViewerWindow, llabs(), LLVOAvatar::mHUDCurZoom, mObjectSelection, LLViewerWindow::mousePointOnPlaneGlobal(), LLVector3::mV, SELECT_TYPE_HUD, TRUE, and VX. Referenced by getMousePointOnPlaneAgent(), LLManipTranslate::handleHover(), and LLManipTranslate::handleMouseDownOnPart(). Definition at line 347 of file llmanip.cpp. References LLSelectMgr::getBBoxOfSelection(), LLBBox::getCenterAgent(), gSelectMgr, mObjectSelection, and SELECT_TYPE_HUD. Referenced by LLManipTranslate::handleHover(), LLManipTranslate::handleMouseDownOnPart(), LLManipRotate::handleMouseDownOnPart(), LLManipTranslate::highlightManipulators(), renderGuidelines(), LLManipTranslate::renderSnapGuides(), LLManipTranslate::renderText(), LLManipTranslate::renderTranslationHandles(), and LLManipRotate::updateVisiblity(). Definition at line 342 of file llmanip.cpp. References LLBBox::getCenterAgent(), LLSelectMgr::getSavedBBoxOfSelection(), and gSelectMgr. Definition at line 204 of file llmanip.cpp. Definition at line 173 of file llmanip.cpp. References f, gAgent, gCamera, LLAgent::getAvatarObject(), LLCoordFrame::getOrigin(), LLViewerCamera::getPixelMeterRatio(), llclamp(), llfloor(), llmax(), LLVOAvatar::mHUDCurZoom, mObjectSelection, LLVector3::normVec(), and SELECT_TYPE_HUD. Referenced by LLManipScale::dragCorner(), LLManipScale::dragFace(), LLManipTranslate::handleHover(), LLManipTranslate::handleMouseDownOnPart(), LLManipTranslate::renderSnapGuides(), and LLManipScale::renderSnapGuides(). Reimplemented in LLManipRotate, LLManipScale, and LLManipTranslate. Definition at line 199 of file llmanip.cpp. Referenced by LLManipTranslate::handleDeselect(), LLManipScale::handleDeselect(), and LLManipRotate::handleDeselect(). Definition at line 209 of file llmanip.cpp. References FALSE, gViewerWindow, LLTool::hasMouseCapture(), lldebugst, llendl, mObjectSelection, LLViewerWindow::setCursor(), LLTool::setMouseCapture(), TRUE, and UI_CURSOR_ARROW. Referenced by LLToolCompRotate::pickCallback(), LLToolCompScale::pickCallback(), and LLToolCompTranslate::pickCallback(). Definition at line 232 of file llmanip.cpp. References FALSE, LLTool::hasMouseCapture(), LLTool::setMouseCapture(), and TRUE. Referenced by LLManipTranslate::handleMouseUp(), LLManipScale::handleMouseUp(), and LLManipRotate::handleMouseUp(). Definition at line 194 of file llmanip.cpp. References LLSelectMgr::getEditSelection(), gSelectMgr, and mObjectSelection. 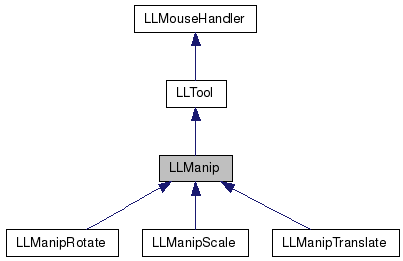 Referenced by LLManipTranslate::handleSelect(), LLManipScale::handleSelect(), and LLManipRotate::handleSelect(). Definition at line 294 of file llmanip.cpp. References a, b, f, F_APPROXIMATELY_ZERO, FALSE, gAgent, gCamera, LLCamera::getAspect(), LLAgent::getAvatarObject(), LLAgent::getCameraPositionAgent(), LLViewerWindow::getWindowHeight(), LLViewerWindow::getWindowWidth(), gViewerWindow, llmin(), LLVOAvatar::mHUDCurZoom, mObjectSelection, LLViewerWindow::mouseDirectionGlobal(), LLVector3::mV, LLVector3::normVec(), SELECT_TYPE_HUD, TRUE, and VX. Referenced by LLManipScale::dragCorner(), and LLManipScale::dragFace(). Definition at line 75 of file llmanip.cpp. 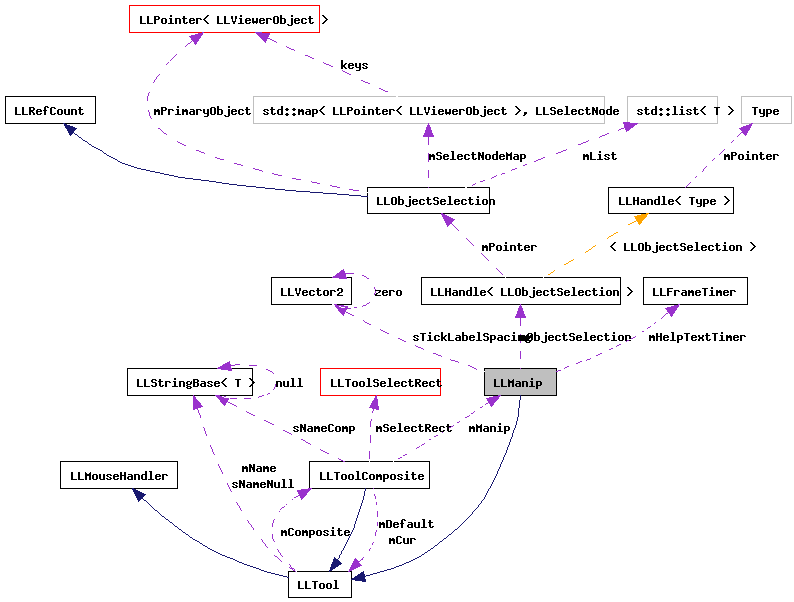 References LLDrawable::getVOVolume(), gPipeline, LLPipeline::markRebuild(), LLViewerObject::mDrawable, LLDrawable::MOVE_UNDAMPED, LLDrawable::REBUILD_VOLUME, LLDrawable::setState(), TRUE, and LLDrawable::updateMove(). Referenced by LLManipRotate::drag(), LLManipScale::dragCorner(), LLManipTranslate::handleHover(), and LLManipScale::stretchFace(). Definition at line 357 of file llmanip.cpp. References f, LLQuaternion::getAngleAxis(), LLSelectMgr::getGrid(), getPivotPoint(), glBegin, glColor4f, glEnd, glPopMatrix, glRotatef, glTranslatef, gSelectMgr, gWorldPointer, mObjectSelection, LLVector3::mV, RAD_TO_DEG, LLUI::setLineWidth(), TRUE, VX, VY, VZ, x, y, and z.
Referenced by LLToolCompRotate::render(), LLToolCompScale::render(), LLToolCompTranslate::render(), LLManipTranslate::render(), and LLManipTranslate::renderSnapGuides(). Definition at line 482 of file llmanip.cpp. References LLColor4::black, f, gAgent, LLAgent::getAvatarObject(), LLResMgr::getRes(), LLFontGL::getWidthF32(), glPopMatrix, gResMgr, gViewerWindow, hud_render_utf8text(), LLFONT_SANSSERIF, LLVOAvatar::mHUDCurZoom, mObjectSelection, LLColor4::mV, LLFontGL::NORMAL, SELECT_TYPE_HUD, LLViewerWindow::setupViewport(), and VALPHA. Definition at line 511 of file llmanip.cpp. References LLColor4::black, f, gAgent, LLAgent::getAvatarObject(), LLResMgr::getDecimalPoint(), LLResMgr::getRes(), LLFontGL::getWidthF32(), glPopMatrix, gResMgr, gViewerWindow, hud_render_utf8text(), llabs(), LLFONT_SANSSERIF, LLFONT_SANSSERIF_SMALL, llround(), lltrunc(), LLVOAvatar::mHUDCurZoom, mObjectSelection, LLColor4::mV, LLFontGL::NORMAL, S32, SELECT_TYPE_HUD, LLViewerWindow::setupViewport(), LLLocale::USER_LOCALE, and VALPHA. Referenced by LLManipTranslate::renderSnapGuides(), and LLManipScale::renderSnapGuides(). Definition at line 421 of file llmanip.cpp. References LLColor4::black, f, FALSE, gCamera, LLCoordFrame::getAtAxis(), LLViewerWindow::getDisplayScale(), LLViewerImageList::getImage(), LLCoordFrame::getOrigin(), LLResMgr::getRes(), LLControlGroup::getString(), LLViewerWindow::getWindowHeight(), LLViewerWindow::getWindowWidth(), gImageList, gl_draw_scaled_image_with_border(), glColor4f, glPopMatrix, gResMgr, gViewerArt, gViewerWindow, hud_render_text(), LLFONT_SANSSERIF, MIPMAP_FALSE, LLVector3::mV, LLVector2::mV, LLFontGL::NORMAL, S32, LLUUID::set(), LLViewerWindow::setup2DRender(), LLViewerWindow::setup3DRender(), TRUE, LLLocale::USER_LOCALE, utf8str_to_wstring(), VERTICAL_OFFSET, VX, VY, and VZ. Referenced by LLManipScale::render(), LLManipRotate::render(), and LLManipTranslate::renderText(). Definition at line 584 of file llmanip.cpp. References f, gColors, LLControlGroup::getColor(), LLControlGroup::getF32(), gSavedSettings, gViewerWindow, LLColor4::mV, LLUI::setLineWidth(), LLViewerWindow::setupViewport(), and VALPHA. Referenced by LLManipTranslate::renderSnapGuides(), LLManipScale::renderSnapGuides(), and LLManipRotate::renderSnapGuides(). Definition at line 243 of file llmanip.cpp. References LLControlGroup::getBOOL(), LLControlGroup::getS32(), gSavedSettings, and sGridMaxSubdivisionLevel. Definition at line 154 of file llmanip.h. Referenced by LLManipTranslate::handleMouseDownOnPart(), LLManipScale::handleMouseDownOnPart(), LLManipTranslate::renderSnapGuides(), and LLManipScale::renderSnapGuides(). Definition at line 157 of file llmanip.h. Referenced by LLManipScale::conditionalHighlight(), getHighlightedPart(), LLManipTranslate::handleDeselect(), LLManipScale::handleDeselect(), LLManipRotate::handleDeselect(), LLManipTranslate::handleMouseDown(), LLManipScale::handleMouseDown(), LLManipRotate::handleMouseDown(), LLManipTranslate::handleMouseDownOnPart(), LLManipScale::handleMouseDownOnPart(), LLManipRotate::handleMouseDownOnPart(), LLManipTranslate::highlightManipulators(), LLManipScale::highlightManipulators(), LLManipRotate::highlightManipulators(), LLManipRotate::render(), LLManipTranslate::renderArrow(), and LLManipTranslate::renderTranslationHandles(). Reimplemented in LLManipScale, and LLManipTranslate. Definition at line 155 of file llmanip.h. Referenced by LLManipRotate::dragConstrained(), and LLManipRotate::renderSnapGuides(). Definition at line 156 of file llmanip.h. Referenced by LLManipTranslate::canAffectSelection(), LLManipScale::canAffectSelection(), LLManipRotate::canAffectSelection(), LLManipRotate::drag(), LLManipRotate::dragConstrained(), LLManipScale::dragCorner(), LLManipRotate::dragUnconstrained(), LLManipRotate::getConstraintAxis(), getMousePointOnPlaneGlobal(), LLManipRotate::getObjectAxisClosestToMouse(), getPivotPoint(), getSelection(), getSubdivisionLevel(), handleDeselect(), LLManipTranslate::handleHover(), LLManipScale::handleHover(), LLManipRotate::handleHover(), handleHover(), LLManipRotate::handleMouseDown(), LLManipTranslate::handleMouseDownOnPart(), handleSelect(), LLManipTranslate::highlightManipulators(), LLManipScale::highlightManipulators(), LLManipRotate::highlightManipulators(), nearestPointOnLineFromMouse(), LLManipTranslate::render(), LLManipScale::render(), LLManipRotate::render(), LLManipScale::renderFaces(), renderGuidelines(), LLManipTranslate::renderSnapGuides(), LLManipScale::renderSnapGuides(), LLManipRotate::renderSnapGuides(), LLManipTranslate::renderText(), renderTickText(), renderTickValue(), LLManipTranslate::renderTranslationHandles(), LLManipScale::stretchFace(), LLManipScale::updateSnapGuides(), and LLManipRotate::updateVisiblity(). Definition at line 163 of file llmanip.h. Referenced by LLManipScale::dragCorner(), LLManipScale::dragFace(), LLManipTranslate::handleHover(), LLManipTranslate::handleMouseDownOnPart(), LLManipTranslate::renderSnapGuides(), LLManipScale::renderSnapGuides(), and updateGridSettings(). Definition at line 164 of file llmanip.h. Definition at line 160 of file llmanip.h. Definition at line 159 of file llmanip.h. Definition at line 162 of file llmanip.h. Definition at line 161 of file llmanip.h. Definition at line 165 of file llmanip.h.